T. E. Lawrence was renowned for his liaison role during the Sinai and Palestine Campaign, and the Arab Revolt against Ottoman Turkish rule of 1916–18. The breadth and variety of his activities and associations, and his ability to describe them vividly in writing, earned him international fame as Lawrence of Arabia – a title used for the 1962 film based on his First World War activities. It depicts Lawrence's experiences in the Arabian Peninsula during World War I, in particular his attacks on Aqaba and Damascus and his involvement in the Arab National Council. British explorer, intelligence officer, and writer (1888-1935). 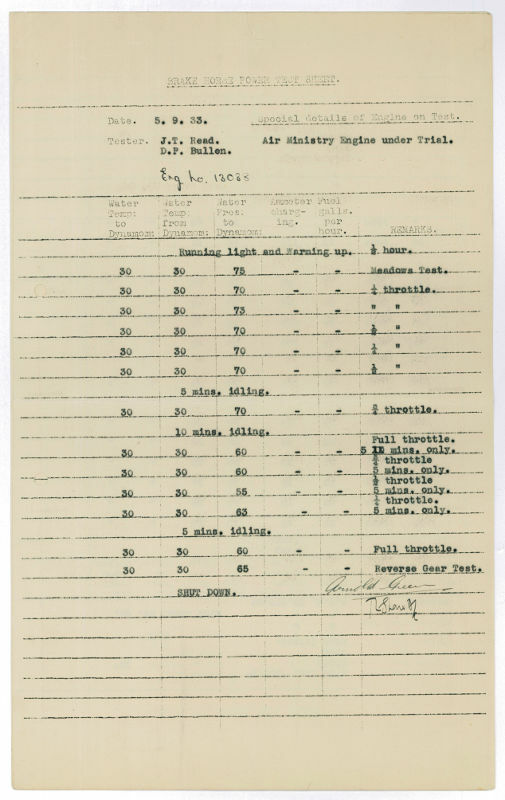 Typed document signed ("T. E. Shaw A/C" and "Arnold Green"). No place. Folio (13 x 8 inches). 2 pp. Brake Horse Power Test Sheet for a 8/28 h.p. engine. 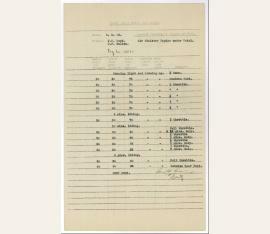 The document dates from Aircraftsman Shaw's second spell with the Air Force. It is completed with technical data including water temperature‚ oil pressure‚ etc. Marked "Air Ministry Engine Under Trial"‚ it apparently relates to the testing of the marine engines of the type installed in powered dinghies used for ferrying air and ground crews to moored flying boats and for general coastal duties. An intriguing document from his later Air Force days, and a splendid document late in life, when Lawrence was working on speed boats and motors. British explorer, intelligence officer, and writer (1888-1935). 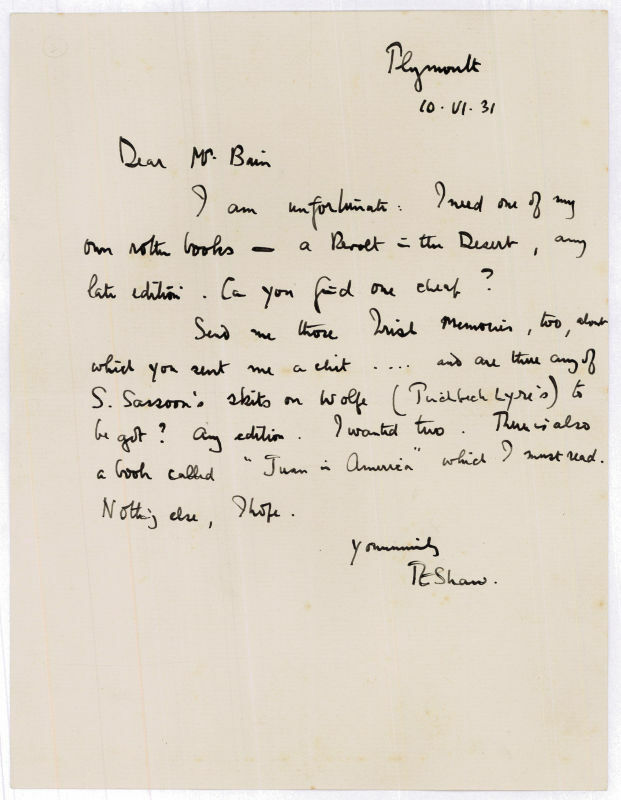 Autograph letter signed ("TE Shaw"). Clouds Hill, Dorset. 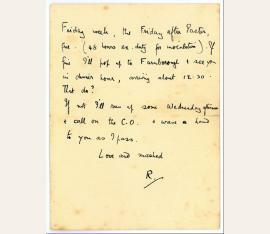 4to 1 p.
To Mr. Richard: "Your request rather worries me. My writing has no literary pretension, but has attracted notice since people have told stories about my oddness, making me out a romantic person - and it is considered curious that such a one should wish to write. Your paper is meant, you say, to be rather good. If so, why strain after a contribution from the merely notorious? I think I must wait till I have bought your first number + judged it for myself [...]". British explorer, intelligence officer, and writer (1888-1935). 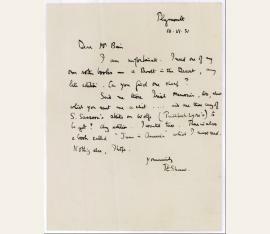 Autograph letter signed ("TE Shaw"). Southampton. 8vo. 2 pp. and 2 lines on bifolium. 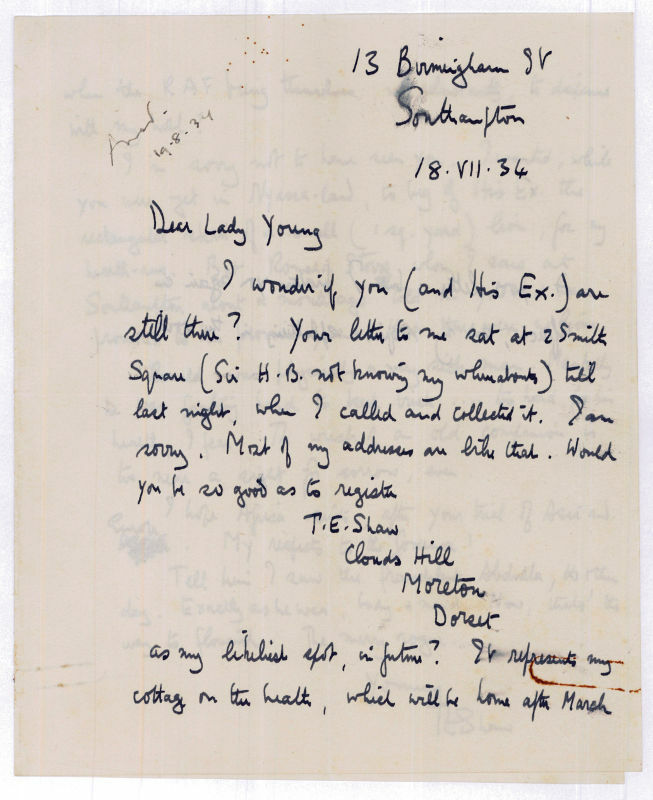 "Dear Lady Young I wonder if you (and His Ex.) are still there? 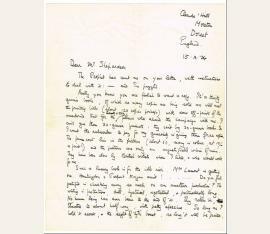 Your letter to me sat at 2 Smith Square (Sir H. B. not knowing my whereabouts) till last night, when I called and collected it. I am sorry. Most of my addresses are like that. Would you be so good as to register | T.E. Shaw | Clouds Hill | Moreton | Dorset | as my likeliest spot, in future? It represents my cottage on the heath, which will be home after March when the RAF bring themselves, not reluctantly, to dispense with my help? I'm sorry not to have seen you. I wanted, while you were yet in Nyasa-land, to beg of His Ex. The rectangular skin of a small (1 sq. yard) lion, for my hearth-rug. But Ronald Storrs whom I saw at Southampton about a month ago told me you had been promoted to his province, and that there were no lions. Ronald was physically a very sick man. Mentally he was fighting hard to keep brisk…too hard for his health, I fear. The wreck of an old companion is too near a sight for sorrow, even. I hope Africa suits, after your trial of Asia and Europe. My respects to the Governor! Tell him I saw the fraudulent Abdulla, the other day. Exactly as he was, body & mind. Now, that's the way. 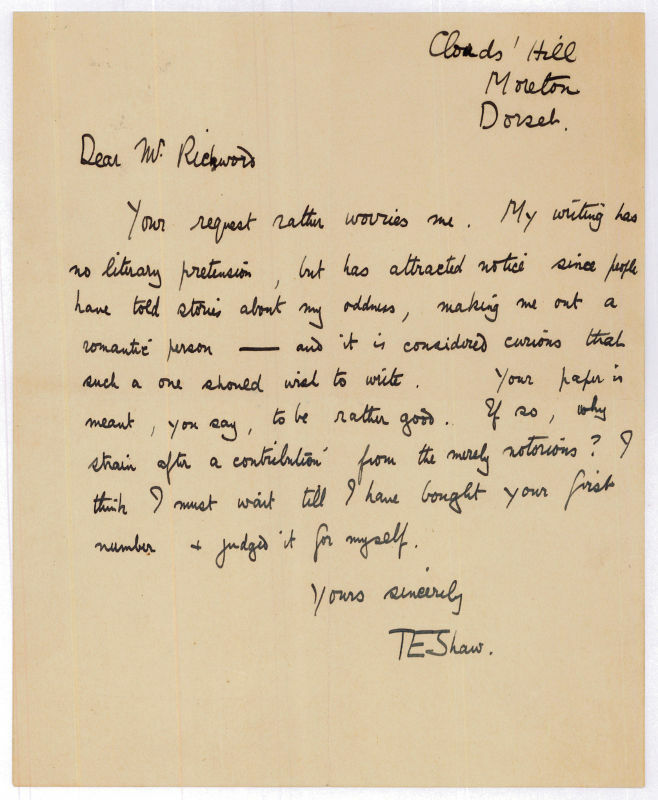 / Yours sincerely TE Shaw / A poor letter: but I picture you again in Africa, and my squib spluttering in the void". - Between 1916 to 1918, Abdullah I of Jordan worked with the British guerrilla leader T. E. Lawrence (with whom he had actually never jarred), and played a key role as architect and planner of the Great Arab Revolt against Ottoman rule, leading guerrilla raids on garrisons. From 1921 until his assassination in 1951, Abdullah ruled Jordan, first as Emir under a British Mandate from 1921 to 1946, then as King of an independent nation from 1946 onwards..
British explorer, intelligence officer, and writer (1888-1935). 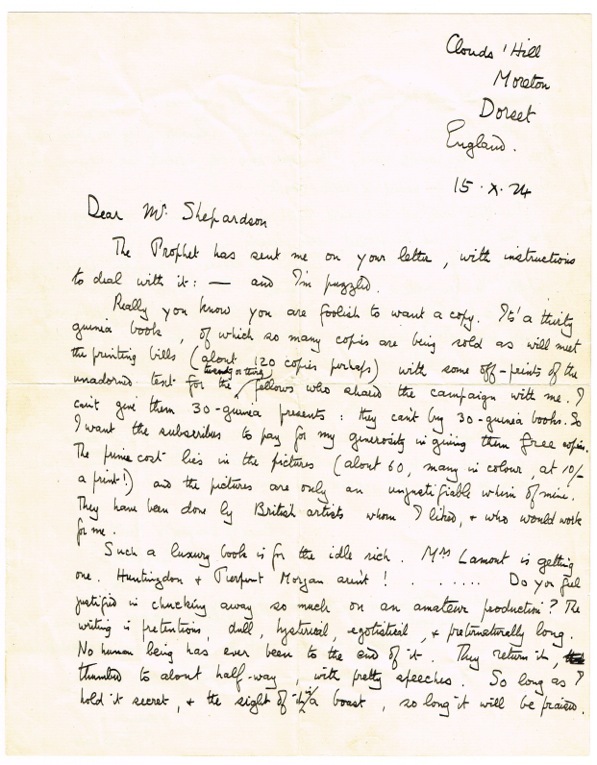 Autograph letter signed ("TE Shaw"). Plymouth. 4to. 1 p.
To a Mr. Bain, apparently a bookseller: "I am unfortunate: I need one of my own rotten books - a Revolt in the Desert, any late edition. Can you find one cheap? Send me those Irish Memories, too, about which you sent me a chit ... and are there any of S. Sassoon's skits on Wolfe (Pinchbeck Lyre's) to be got? Any edition. I wanted two. There is also a book called 'Juan in America' which I must read. Nothing else, I hope [...]". - Traces of folds. British explorer, intelligence officer, and writer (1888-1935). 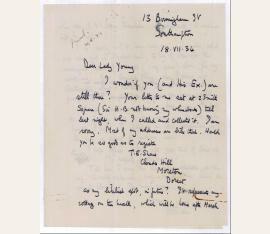 Autograph letter signed ("TE Shaw"). Clouds Hill, Moreton, Dorset. 8vo. 2 pp. With autogr. envelope. Includes TDS by G. E. B. Bromley-Martin, of the Bank of Liverpool and Martin, London (dated 22 Dec. 1924). To Whitney H. Shepardson of New York, who had inquired as to how he might obtain a copy of the "Seven Pillars of Wisdom" when the book was finally published: "The Prophet has sent me on your letter, with instructions to deal with it: - and I'm puzzled. Really you know you are foolish to want a copy. It's a thirty guinea book, of which so many copies are being sold as will meet the printing bills (about 120 copies perhaps) with some off-prints of the unadorned text for the twenty or thirty fellows who shared the campaign with me. I can't give them 30-guinea presents: they can't buy 30-guinea books. So I want the subscribers to pay for my generosity in giving them free copies. The prime cost lies in the pictures (about 60, many in colour, at 10/- a print!) and the pictures are only an unjustifiable whim of mine. They have been done by British artists whom I liked, + who would work for me. Such a luxury book is for the idle rich. Mrs. Lamont is getting one. Huntingdon [!] + Pierpont Morgan aren't...! ... Do you feel justified in chucking away so much on an amateur production? The writing is pretentious, dull, hysterical, egotistical, + preternaturally long. No human being has ever been to the end of it [the 335,000 word ms.]. They return it, thumbed to about half way, with pretty speeches. So long as I hold it secret, the sight of it is a boast, so long it will be praised. Seriously, it isn't any earthly good. It costs as I have said, may be a year yet in printing, + is horrible in parts. Eleanor (beg her pardon, but that's her only possible name. The proper ones only indicate her wayward choice of parents etc.) would be sick over it. The thing will not be reprinted entire in my life-time: you suggest 'for a long time.' ... but the prospect isn't pleasing. There will be an American Edition, to secure copyright. Doubleday, probably. He has made a reasonable estimate. It would be printed at my expense, two copies for the Library of Congress, or whatever the show is, + eight for sale: + the sale price will be prohibitive, so that they will never sell, + the edition will never be exhausted, + no one may pirate! I suggest 10,000 dollars, but F.N.D. hasn't yet considered what is above-high-water-mark in U.S.A. Tell me, please, if you are knowing! If despite all faults (my most honest dissuasion puts people on sometimes!) you want a copy: then you'll have to send fifteen guineas, half price - E. will know the size of the extinct coin - to: Manager / Bank of Liverpool + Martins / 68 Lombard St. / London, E.C.3, payable to TE Lawrence, + 'Seven Pillars account' . Balance when you get the book. Let me strongly urge you not to. I have 90 subscribers, so there is no urgency - on the point of helping lame dogs! [...]". - When the book finally appeared in 1926, the cost of each copy to Lawrence was triple the selling price, and it was not until the fourth reprint of the 1927 abridgement "Revolt in the Desert" that his debts were paid off. As the included receipt shows, Shepardson was undeterred and duly transferred the £15. 15/- to Liverpool & Martins' (the last copy of the 1926 "Pillars" at auction commanded £30,000 at Sotheby's in 2009). - The U.S. businessman Whitney Hart Shepardson (1890-1966), educated at Colgate, Balliol (as a Rhodes Scholar), and Harvard, had served as aide to the State Department at the 1919 Paris Peace Conference, where he may have met Lawrence. Between 1925 and 1927 he served as director on J. D. Rockefeller's General Education Board. A leading O.S.S. operative in WWII, he was the first London head of Secret Intelligence and remained with the organization soon to become the C.I.A. until 1946..
Autograph cheque signed ("J. H. Ross"). 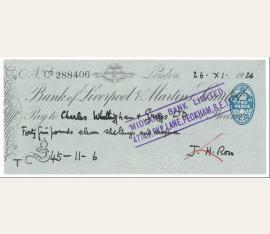 A Bank of Liverpool & Martins cheque filled in and signed by Lawrence. - The subscribers edition of "The Seven Pillars of Wisdom" appeared in December 1926, lavishly illustrated by Eric Kennington and other contemporary artists. The plates were printed by Charles Whittingham & Griggs, a difficult task, made the more so by Lawrence's perfectionism. Artistically, it was a resounding success, but the cost of printing meant that Lawrence sustained a substantial loss on the edition. This cheque for £45-11-6 (equivalent to roughly £1200 in modern terms) is most likely partial payment for the plates. 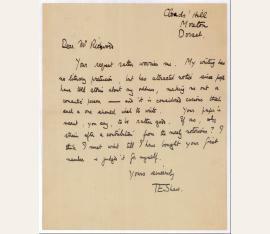 Autograph letter signed ("TE Shaw").